Everybody knows that not only are houseplants super trendy right now, they are also beneficial to our health! But do you know why? Plants are Living Art - Surrounding yourself with things that you find pleasing to look at helps to make you feel happy and content in your life. 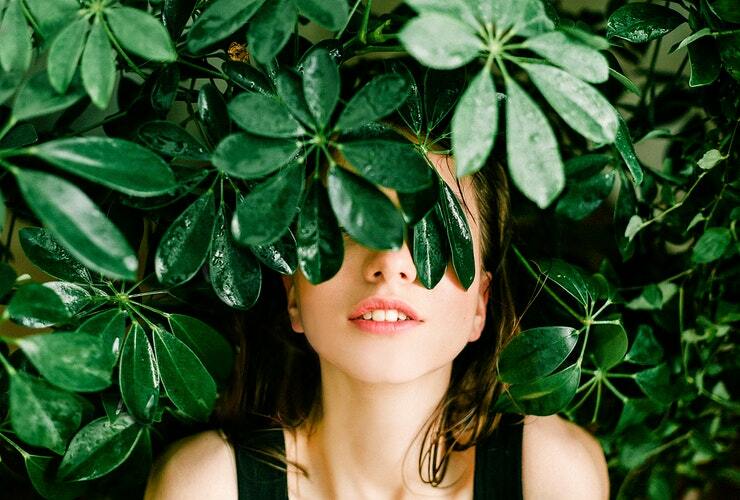 Some people like to decorate their homes with ornaments or wall art, but those of you who choose to adorn your rooms with luscious green plants have the added benefit of witnessing something beautiful grow in front of your very eyes, and this can lead to increased feelings of satisfaction and achievement - especially if you have managed to keep your plants alive. Keep reading for more info on how to do that below! Indoor Plants Improve Concentration & Productivity - Did you know that placing plants in your living room, kitchen and study helps to improve your concentration and productivity by up to 15%? That's massive. Studies have proven that houseplants decrease stress levels and help to boost your mood, which is why you often see large plants hanging around in big offices. Houseplants Help to Purify the Air - As the title of this article states, plants kept in and around the home can help to improve the quality of the air that you are breathing in every single day. 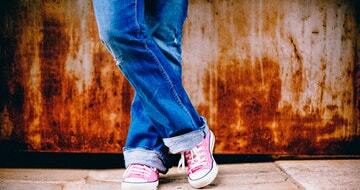 Read on to find out how they do this. The easiest way to understand how houseplants benefit us is to think of them as functioning in kind of the opposite way that we do. When we breathe we take in oxygen and we breath out carbon dioxide. Plants on the other hand absorb carbon dioxide and release oxygen, which makes them the perfect housemates as far as I am concerned. Did you know that according to extensive research conducted by NASA, houseplants have the ability to remove up to 87% of toxins from the air in your home in just a 24-hour period? Oh yeah. Those of you who live on a main road may want to take note. How Many Houseplants Do You Need To Purify The Air In Your Home? NASA also informs us, according to one of their clever studies, that it does in fact take quite a few houseplants to do the job of cleaning our air effectively though. So if you want to make the most of the air-purifying qualities of your houseplants don't be afraid to indulge in your houseplant hoarding tendencies. If your spouse ever gives you the judgemental eye the next time you lead them towards the plant section in the supermarket, just throw NASA at them! Those of you who rather like the look of the droolworthy indoor urban jungles you see being posted on Instagram, Pinterest and Youtube will be rather pleased to know that NASA recommends 15-18 plants, with plant pots of around 6-8 inches in diameter in an average 1,800 square foot house for optimal results. If you don't have that many, I suggest you get working on it. Any excuse to beautify your home with that awesome living art. Luckily there are so many wonderful varieties of houseplants to choose from, many of which have surprisingly simple care guidelines, even for the blacker-fingered hopeless plant lover. Here are some of the more common houseplants for you to look after, that won't break the bank, or die on you as soon as you place them down in your home. You can usually find these in your local Garden Centre, and sometimes in the supermarket. If not, they are very easy to find online, just take a look on Ebay. The Pothos Plant (Epipremnum aureum), or Devil's Ivy as it is often known, comes in a pleasing variety of types for you to choose from, there are solid green varieties in different shades, and variegated varieties too. They are vining plants, which means you can grow them up a pole in a large pot to create the effect of having an indoor tree in the corner of your living room if you don't necessarily want to fork out the money for an enormous tree-like houseplant, because they can get pretty expensive. Or you can display them as hanging plants and let the vines trail down to the floor. 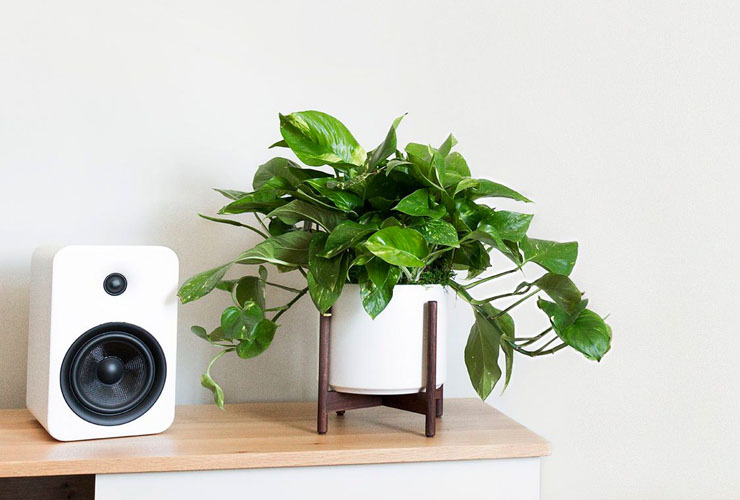 I have even seen some people get super creative, attaching their vining Pothos to the wall so that it can creep around the room to create a great jungle vibe! Pothos are extremely easy to care for, and they are popular because they are happy to live in a wide range of environments. If you have a bright sunny room, fantastic because they love bright indirect light, so just place one somewhere inside of the room, but not necessarily right inside the window. They also do well in lower light, so don't worry if your house is a bit on the gloomy side, the Pothos is going to brighten up your days. You can grow these plants in dry soil watering very now and then, and you don't have to fuss about how nutrient dense your soil is either, because they don't seem to mind either way. Surprisingly they also do very well in a vase of water. In fact some people like to grow them from an aquarium full of fish! The best thing about this plant is that you can very easily buy one plant and create many new plants from that one plant in a fairly short space of time. Simply cut a bit off and stick the end where the node is in some water and it should start to grow roots before you know it. The Peace Lily (Spathiphyllum) is a popular common houseplant that is also a great air purifier. You can often buy them cheaply when they are quite small in your local flower shop, and they will soon grow into large luscious green plants with the right care. The Peace Lily is a very adaptable and undemanding plant, and once you know what it likes, you don't have to worry about it. The best way to think about them is to remember that they are tropical plants, native to the tropical rainforests of America. This means that they prefer to live in a partially shaded spot, and are often found thriving in rooms that have very little natural light at all. The easiest way to tell when your Peace Lily needs watering is to wait for the leave to droop a little, and then feel the soil as it is probably dry. This is the best time to water it. Once a week is usually a good guideline, but always check the soil and allow it to dry out a little before watering. It doesn't hurt to give them a bit of misting here and there either as they do enjoy a bit of humidity. The Spider Plant (Chlorophytum comosum) is quite possibly the easiest plant of all the houseplants to look after. 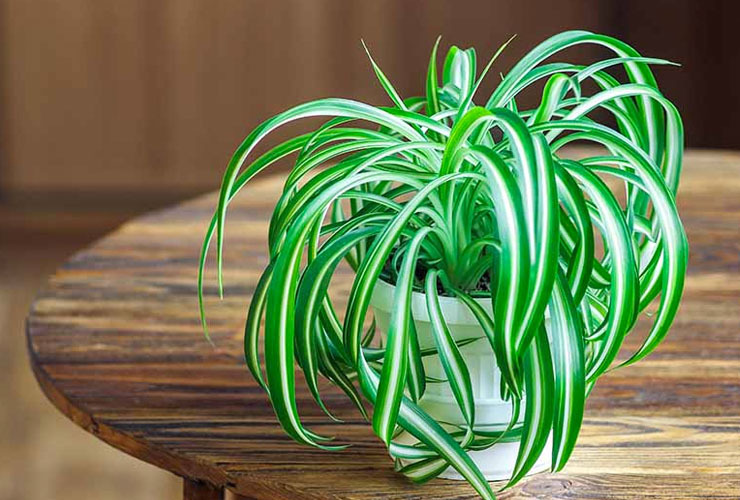 Everyone has a spider plant, and they are brilliant air purifiers. They can grow big and leafy and make beautiful hanging plants, often with lots of cute babies hanging off them which can be removed to make more plants for around your home. You don't need to water them very often at all, just check the soil and water when it is dry. As for light, you can put a spider plant pretty much anywhere and it will be happy. 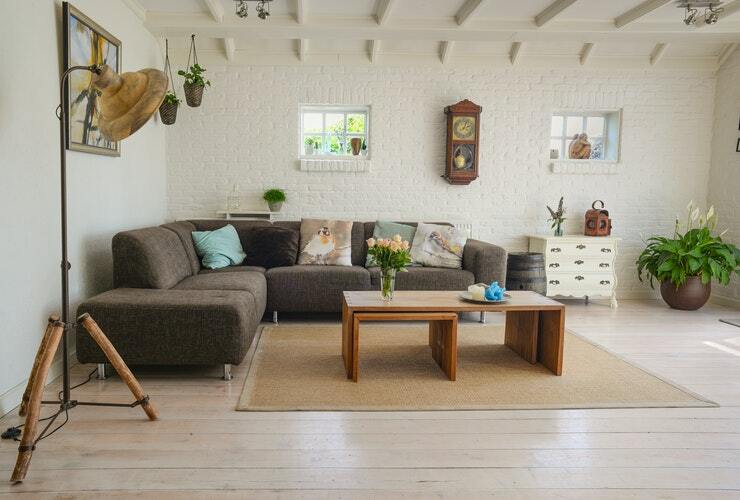 Bright indirect sunlight is best, but a darker corner in your home will suit it just as well, they are not fussy. The more light it has access to of course the faster it will grow and the more babies you will see. As a general rule, especially with the plants mentioned in this article, you should allow the soil to dry out a bit in between watering. You can check this by sticking your finger into the soil to see if it is still damp. If the top inch or so is dry, go ahead and give your plant a drink. The most important thing to remember when watering your plant is to let the water drain through the holes at the bottom and don't let the pot sit in water. You should tip any excess water out of the bottom tray because no plant likes to sit in water for long - it causes root rot, which will lead to a horrible death. And as for light, the best way is to offer as much indirect sunlight as you have available, and keep an eye on your plant at first. If they don't seem to be thriving, and you know that you're not over or under watering, simply bring the plant a little further into the room away from the any strong direct sunlight and you should see it perk up.